The FLSA Federal Minimum Wage Poster is a minimum wage law poster by the Federal Department Of Labor. This is a mandatory posting for all employers in Federal, and businesses who fail to comply may be subject to fines or sanctions. This poster must be posted by every private, federal, state and local government employing any employee subject to the Fair Labor Standards Act. This poster describes the Federal minimum wage as well as overtime pay standards, child labor standards, pay for tipped employees and penalties for employers that try to get around the standards. Any employer of employees to whom sec. 7 of the Fair Labor Standards Act does not apply may alter or modify the poster legibly to show that the overtime provisions do not apply. FE All-In-One Labor Poster: Instead of printing out dozens of posters, employers can also purchase an all-in-one poster that covers both Federal and Federal poster requirements by clicking here . It appears you don't have a PDF plugin for this browser. Please see the link below to download federal-minwage.pdf. OVERTIME PAYAt least 1½ times the regular rate of pay for all hours worked over 40 in a workweek. certain work hours restrictions. Different rules apply in agricultural employment. the minimum hourly wage, the employer must make up the difference. used by the employee to express breast milk. each willful or repeated violation of the minimum wage or overtime pay provisions of the law. Civil money penalties may also be assessed for violations of the FLSA’s child labor provisions. discharging workers who file a complaint or participate in any proceeding under the FLSA. Mariana Islands, and the Commonwealth of Puerto Rico. • Some state laws provide greater employee protections; employers must comply with both. pay protections and correctly classified independent contractors are not. The law requires employers to display this poster where employees can readily see it. There are an additional eighteen optional and mandatory Federal labor law posters that may be relevant to your business. Be sure to also print all relevant state labor law posters, as well as all mandatory federal labor law posters. 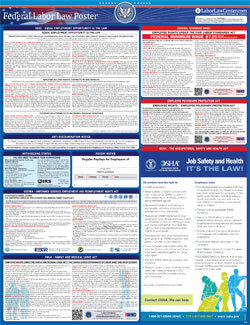 Instead of printing out pages of mandatory state and Federal labor law posters, you can purchase a professional, laminated all-in-one labor law poster that guarantees compliance with all federal and state posting requirements. Fully updated for 2019! While we do our best to keep our list of Federal labor law posters up to date and complete, we cannot be held liable for errors or omissions. Is the poster on this page out-of-date or not working? Please let us know and we will fix it ASAP. LaborPosters.org will email you a printable PDF of this Federal labor law poster, 100% FREE. You'll also get notified when new posters are available. Your Federal poster has been downloaded and emailed! This poster download is provided as-is, with no warranty or guarantees. Please verify with Federal and state authorities to confirm that you are posting all of the correct (and updated) posters required for your type of business. Instead of printing out pages of mandatory state and Federal labor law posters, you can purchase a professional, laminated all-in-one labor poster.